Kei Kamara returned to Leuzinger bearing gifts Thursday afternoon. The 2003 Daily Breeze Player of the Year donated new jerseys for the Leuzinger boys soccer team, surprising the Olympians before Friday's Bay League match at Palos Verdes. "They were a full set of jerseys for the varsity and JV teams," Kamara said. "I heard what was going on in the school district. They're stopping some sports and making kids pay, and it's not something anyone could afford. Luckily, adidas gave me good help with it, too." The players certainly appreciated the gesture by Kamara, who was held in high regard. "It means a lot," midfielder Jose Lezama said. "Right now the economy is really bad, and the school doesn't have much money, so it's cool he's helping us out. We need it more than ever." 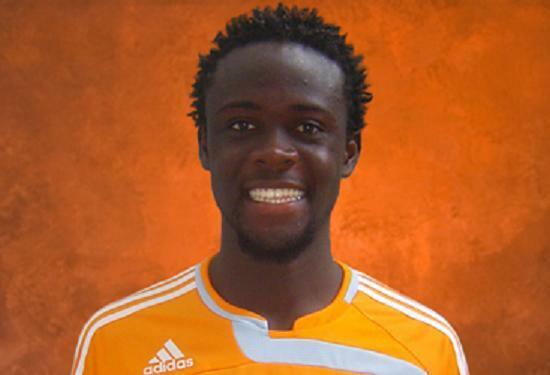 Though Kamara went on to star at Cal State Dominguez Hills and has played for the Columbus Crew, San Jose Earthquakes and now the Houston Dynamos, he has never lost touch with his roots. "Every time I'm in town, I always show up to the school," Kamara said. "I assist with the coaching sometimes. I still know what's going on with Leuzinger and CSDH. They are my families." Leuzinger beat Mira Costa, 3-2, in the Bay League opener, then broke in its new jerseys with a 2-1 comeback win at Palos Verdes. The Olympians are looking to build off last season's second-place finish, and Coach Hugo Ramirez said Kamara's generosity is sending a positive message to his rising team. "It means a lot coming from Kei," Ramirez said. "We talk, and he mentioned he might try to donate something for the kids. He wants to remember Leuzinger, to come back and give something to the kids." Kamara takes pride in helping the Olympians and watching the team develop. "Most of the players have my number," Kamara said. "They always ask me questions, like what college to go to, things like that. We have a good relationship." Lezama said the players certainly appreciate Kamara. "He's really cool, and he helps us out all the time," Lezama said. "Last year he trained with us a little and taught us some new plays. He really helps out Leuzinger." *** Kei Kamara Personal: The son of Fatima Kamara … Family comes first in his life … Awarded a scholarship from the South Bay Referee's Association for attitude and skill on the field … Scored 27 goals for Leuzinger High School in California in 2002 … Earned first-team all-conference honors in his senior season of 2002 … Coaches youth soccer teams … Plays the African drums.